In the grim darkness of the 41st millennium, there is only a bunch of crazy weirdos running around, fighting aliens, collecting crazy gear, and trying to get to Level 10 first. 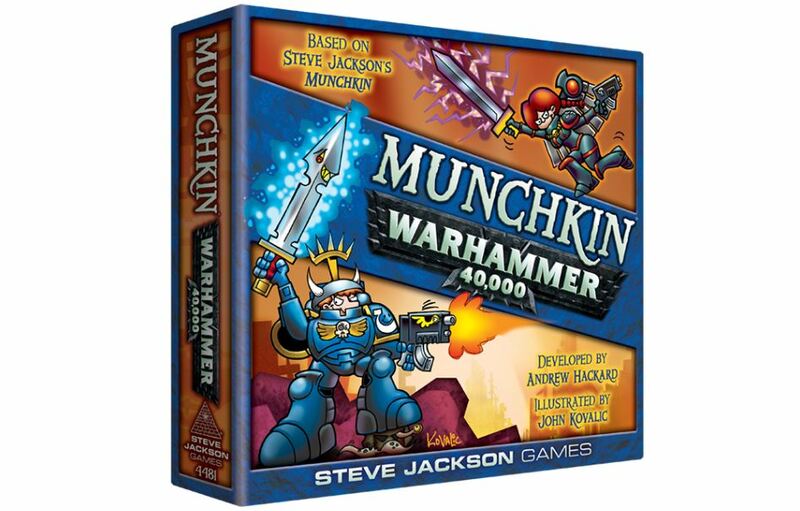 Steve Jackson Games has announced a partnership with Games Workshop to bring you Munchkin: Warhammer 40,000. Steve Jackson Games and Games Workshop announce the biggest, back-stabbiest, most loot-filled heavy-weapons bonanza of the year: Munchkin Warhammer 40,000, coming in 2019 to a game store near you! Since the original Munchkin card game hit the market in 2001, the Munchkin brand has sold over 9 million games and accessories worldwide. Warhammer 40,000, now in its eighth edition, is one of the longest-lasting classic games of miniatures combat. Now these two popular games are merging into a storm of carnage and weirdness guaranteed to satisfy armies of gamers. As with all Munchkin games, Munchkin Warhammer 40,000 will combine easily with the rest of the extensive Munchkin line, including Munchkin Zombies, Star Munchkin, and Munchkin itself. Munchkin Warhammer 40,000 is illustrated by principal Munchkin artist (and extreme Warhammer fanboy) John Kovalic, and designed by Munchkin Line Editor Andrew Hackard, in consultation with Games Workshop. Munchkin Warhammer 40,000 will launch in 2019 in our premiere Deluxe format ($29.95), followed by two 112-card expansions ($19.95) later the same year. That’s almost 400 cards of explosive Munchkin Warhammer fun!